Eau de Lacoste L.12.12 Pour Elle Natural is a fragrance that is mood-lifting, authentic and warm. Its fruity start of pineapple, raspberry leaf and mandarin leads to the heart of woody, powdery orris root along with jasmine and rose. A warm coconut note is combined with sandalwood and amber. The fragrances are available as 90 ml Eaux de Toilette. 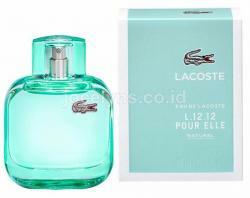 Eau de Lacoste L.12.12 Pour Elle Natural was launched in 2015.